A landmark pub and hotel in Wrexham which closed after its former owner was forced into administration last year is due to re-open. The Wynnstay Arms Hotel closed last July when businesswoman Stephanie Booth's Llangollen Hotels chain got into difficulty. It was taken over by Marston's, which said it has refurbished the Georgian building and will create 40 jobs. The facade of the building is protected. Marston's said the refurbishment and recruitment had been on schedule. 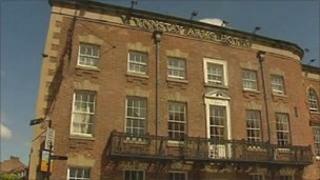 The Wynnstay was the only hotel to shut when administrators were appointed last summer to sell off the chain. The Grade II-listed hotel had been taken over by Ms Booth in April 2010. The building, formerly known as the Eagles Inn, was where the Jacobite society, the Circle of the White Rose met in the 18th Century, including members of the prominent Williams-Wynn family of Wynnstay. The Football Association of Wales was founded at a meeting at the hotel in 1876, and there is a plaque to mark the occasion. There was a campaign to save it from demolition in the 1960s.